For the landing page we wanted to utilise the unique shape and style of the 8O8 logo and incorporate this into the functionality while typing in the user's date of birth. The user will then have access to the site with a full page video displayed and a unique menu to access shortcuts throughout the one-page scroll. The user begins the site with The Drink section then continues into The Bar which showcases the best 8O8 drinks they have to offer. This movement utilises a parallax revealing the whole image behind. Once a cocktail is chosen, a pop-up opens to reveal the finer details which can be navigated internally. 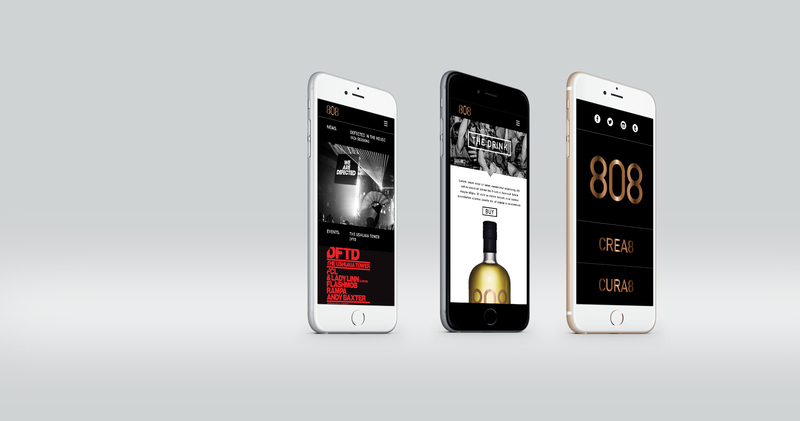 The mobile version condenses all the vital content into a slick and elegant version of the 8O8 site. Vital information has been made prominent and easily accessible to enhance the overall user experience.